The Bay Area Toll Authority, or BATA, manages, invests and distributes the revenues from the region’s seven state-owned toll bridges; and manages the Bay Area's FasTrak® electronic toll payment system. BATA funds the toll bridges' operations, maintenance and administration; and the long-term capital improvement and rehabilitation of the bridges, including projects mandated by Regional Measure 1 (1988), Regional Measure 2 (2004), Regional Measure 3 (2018) and the Toll Bridge Seismic Retrofit Program. 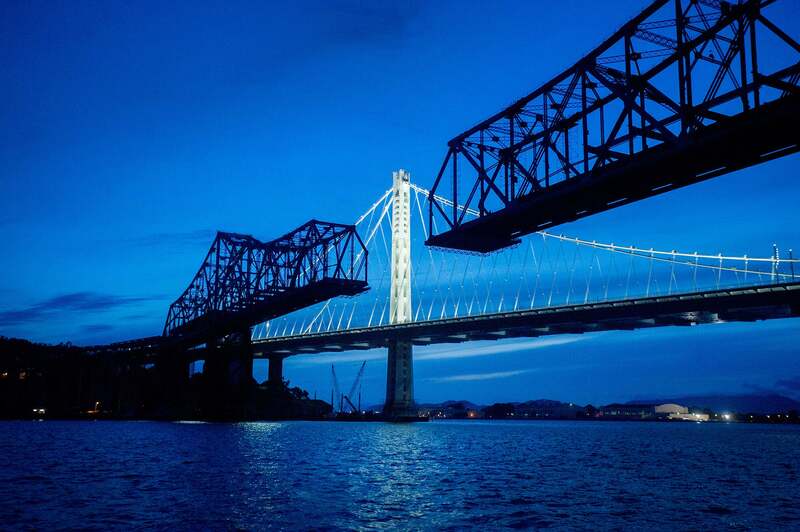 The new span's self-anchored suspension (SAS) tower appears just behind the partially demolished original East Span of the San Francisco-Oakland Bay Bridge, 5-25-2014. BATA originally was created by the state Legislature in 1997 to administer the base $1 auto toll on the Bay Area's seven state-owned toll bridges. It began operations in 1998 under the auspices of MTC. BATA assumed responsibility for managing the Bay Area's FasTrak electonic toll collection program in 2004. FasTrak can be used for toll payment on all of the Bay Area's toll bridges, including the Golden Gate Bridge, on the region's growing network of Express Lanes, and for parking at San Francisco International Airport. The Legislature in 2005 expanded BATA's responsibilities to include administration of all toll revenue from the region's state-owned toll bridges as well as joint oversight of the state Toll Bridge Seismic Retrofit Program with Caltrans and the California Transportation Commission. This 21-member authority meets the fourth Wednesday of each month at 9:30 a.m.
To help solve the Bay Area's growing congestion problems, MTC and local transportation agencies worked with the state Legislature to craft a new ballot measure to fund congestion relief and public transit improvements in bridge corridors paid for by an increase in tolls on the region's seven state-owned toll bridges for the first time since 2010. Known as Regional Measure 3, the measure was approved by Bay Area voters on June 5, 2018. Learn more about Regional Measure 3 and review the Frequently Asked Questions (FAQs) on Regional Measure 3. BATA formally approved the new RM 3 toll schedule in December 2018 through adoption of BATA Resolution No. 128. The Authority also adopted BATA Resolution No. 129, which authorizes arrangements for the escrow of Regional Measure 3 funds pending the resolution of two lawsuits challenging state Senate Bill 595 and Regional Measure 3. Both lawsuits are pending in Superior Court in the City and County of San Francisco. Under BATA Resolution No. 129, the Regional Measure 3 toll increases, when collected, will be placed into an escrow account managed by an independent trustee. Following a process similar to voter-approved sales tax measures that face legal challenge, these funds will be transferred at least once each week from BATA to a Union Bank (Mitsubishi United Financial Group - MUFG) trust account, where the funds will be managed by a bank trust officer until final resolution of all litigation. Once the BATA legal team certifies there is a final resolution, the Authority will be asked to release the escrow. If BATA prevails in the litigation, the funds will be applied to BATA-approved programs. If BATA should lose the litigation, the funds will be reimbursed to tollpayers. All 21 Commissioners serve the Bay Area Toll Authority. See the full Commission Roster.